3D Technology in Cinema: IMAX, RealD, etc. Free Blu-ray Player Software ...? Forget it! Bullitt is probably a moderate classic praised by some and considered boring by others. It sports Steve McQueen, a remarkable car chase sequence, a few other good actors and a decent premise. It's easy to see where the praises are coming from and it is not hard to label it "boring". Cause Bullitt is a well-crafted movie lacking a solid story, unnecessarily prolonged at times and having a redundant character. 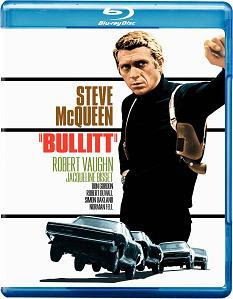 Bullitt is titled by the name of its protagonist, the San Francisco cop, Frank Bullitt (Steve McQueen). After being asked by Senator Walter Chalmers to protect an important witness for a US Senate subcommittee hearing, Bullitt hides Johnny Ross in a hotel and assembles a small police team to guard him. Ross does not survive to testify at the hearing since he is killed despite his accommodation in a secret location. Chalmers blames Lieutenant Bullitt for the loss of the witness. The lieutenant is not convinced that the Senator is telling him everything though and receives full authority from his superior to lead the investigation. He decides to act without explaining or reporting his actions in order to solve the case and save his reputation as reliable cop. The story of Bullitt has a good premise and the movie starts intriguing but its promising beginning is overshadowed by a slow pace and boring events later. We do not clearly understand until the end what has been the purpose of the initial events happening in the movie and why such a complicated approach has been chosen by the people involved in them to achieve their goal. We also have to meet Bullitt's girlfriend (Jacqueline Bisset) although her presence is practically redundant. Bisset is a beautiful woman and it's nice to see her but her character does not contribute anything to the plot. She's just there to add some female presence in the otherwise masculine film. If the above flaws had not been there Bullitt could have been a really good movie. Steve McQueen is very believable as the San Francisco cop having its own ways of investigating a case. In fact, the role suits McQueen perfectly. The rest of the cast is also of high quality. Robert Vaughn makes a notable performance as Chalmers and Robert Duvall has a small but important part as taxi driver. Bullitt makes a good use of the city of San Francisco and its surroundings. The ending is kind of original although I'm not sure it is to everybody's taste. The main gem in this movie though is the famous car chase scene. It is very natural without myriads of special effects and it would be nice if more recent films containing "spectacular" chase sequences had learned better from movies like Bullitt. The film's cinematography and editing are very good. If director Peter Yates had been able to make the movie more involving in spite of its somehow weak narrative this could be a true classic. Bullitt is an easy recommendation for car chase fans or lovers of 60's and 70's thrillers. If you are more into modern movies you should probably choose the right mood to watch it or better, read some other reviews of this film before taking a decision.